"Gel" is a massive buzzword in polish and it only seems to be getting bigger and more vague. It's caused a ton of confusion because now there are three types of polish using the same word. Before we get into this review, I'm gonna take a moment to clear things up. The differences boil down to how they cure. Lamp-cured gels require either UV or LED lamps to harden. They come in opaque bottles and are tough to remove. 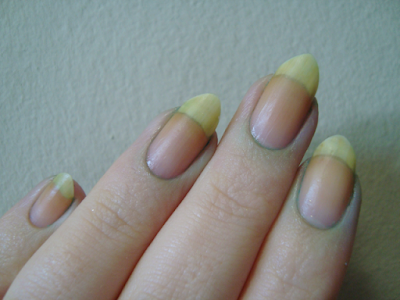 No lamp gels are part of a system of polish, topcoat, and sometimes basecoat. Some won't cure unless the topcoat is used, and the topcoat itself comes in a tinted or wrapped glass bottle because it has some UV-reactive ingredients. They're sorta a hybrid of gel and conventional polish, curing partly with air and partly with light. Then there's gel-like polish. It's conventional polish, but it does tend to be a bit shinier and "plumper" than most. Like SinfulShine*, L.A. Colors Color Craze Gel is gel-like. It's "just regular polish", but all squishy and shiny. I can get behind squishy and shiny and I'm always a sucker for a dark blue crelly, so when I found Tempt in a display at Big Lots, I grabbed it. Tempt is a a royal blue crelly. Yep. Bubbles. The formula and finish are both really thick. I'll be thinning this one, for sure. It's a skin stainer, which you can also see if you look at my cuticles. 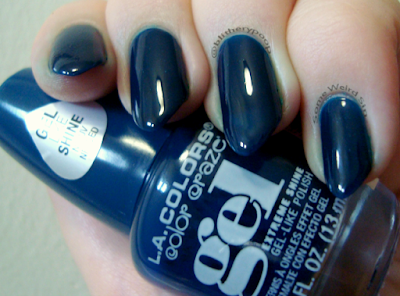 The photo above is two coats of Tempt, without topcoat. It's decently glossy, but the bubbles kill the smoothness. I had to see if topcoat fixed things up. Yes and no. I think I kinda prefer it without. It's already so thick that I feel like topcoat makes it look excessive. I wore Tempt for maybe an hour total. No nail staining in that time, but a couple of days might have been a different story. The bluticals were far from the worst I've ever had, but they're undeniable. Cuticle remover fixed things right up. Bottom line: Tempt is a bubble-prone stainer, but it's also really pretty. Not regretting it, but I'm withholding full judgement until I thin it. Would I try another shade? Probably. *I'm actually not 100% about the rerelease of SinfulShine. I haven't seen the new ones yet and I can't find the topcoat ingredients anywhere. 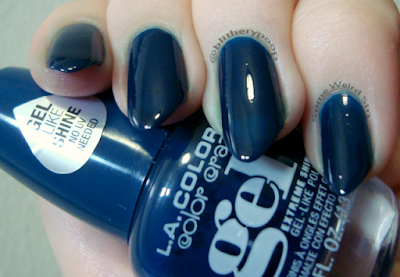 I'm guessing it's probably still gel-like, but the topcoat looks like it's in an opaque bottle. It's a mystery. If anyone can tell me the ingredients, I'll love you forever!